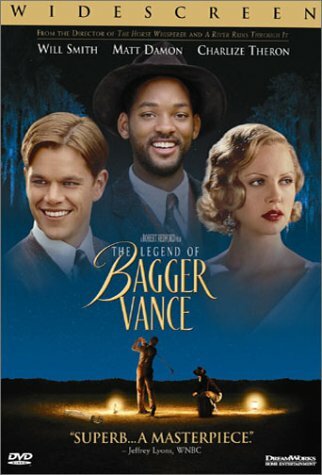 By the time you reach the end of the legend of Bagger Vance you realize that there is more to the story than meets the eye. To the casual movie watcher, it is the story about how a legendary golfer from the town of Savanna lost and then found his swing. But if you dig deeper you realize that the movie actually wants to give you an answer to all your life’s problems. Problems you may have faced in the past, the ones you may be facing now and the ones that you are still to face. The movie does all this through the simple yet complicated game of golf. For those of us familiar with the Bhagwat Gita, Ranulph Junuh could well be the Pandav prince Arjun and Bagger Vance could very well be Lord Krishna. Ranulph Junuh is cornered into a situation he can’t get out of. To walk away would be to run away. To run away would be to bring shame to his city that looked up to him almost like a Demi God. That was something he was not prepared to do under any circumstances. He was already crumbling under the sorrow of loosing his troupe mates in the war. He already felt that he’d betrayed them by surviving. He could not bear to betray anyone else again. The war was something he had no control over but this was a decision that was up to him. So he chose to play. In the words of Hardy Greaves, the narrator, he had no choice but to come to terms with his inner demons, but he had to see which demon was giving him the most aggravation. We feel that it would be best to portray the movie and its message through its dialogues. Even though most of the dialogues seem to be written for the purpose of good narration of the story, every once in awhile there comes a dialogue that hits you so hard it takes your breath away. One of the prominent scenes is when Ranulph Junuh first meets Bagger Vance. Junuh asks Bagger if he is a caddie. To this Bagger replies, “It depends, are you a golfer?” This simple statement stumps Junuh completely. It forces him to look inside himself and check who he really is. Golf and Junuh were taken for granted but Junuh was not so sure anymore. There are so many times that Bagger teaches you about life when it seems that he’s just making stray comments about golf. “They say that a man’s grip on his club is like a man’s grip on his world”. Here the club signifies the self. Unless a person has control over himself he has no influence on the world. That is when a man becomes helpless and lost. That is when he loses his swing. Bagger keeps emphasizing the point that we all have our role to play in this world. He calls it our game, or our one authentic shot. The one we were born with, the one only we are supposed to play. The overall game is governed by the same framework for everybody, like golf. But how we play it is only up to us. No one else can play it for us. To emphasize this point the narrator describes the playing styles of all three players in the tournament, Bobby Jones, Walter Hagen and Ranulph Junuh. One can imagine each of these people to be normal men just leading their lives making each decision as it comes to the best of their capability, driven by their own personalities and character. Bobby Jones played each shot with the utmost concentration, contemplating and considering each and every variable involved. He was patient and thorough. He wouldn’t play a shot unless he’s absolutely sure that that is the shot to play. The other extreme was Walter Hagan. He’d take a risk and play the shot he thinks is appropriate. He leaves room for error and is not shaken by it. One shot played, he looks forward to the next one. He knows that there is always another chance to undo the damage done. Hence the quote “three lousy shots and one brilliant shot can still make par”. If we were to interpolate the golf tournament to the business arena, we could say that each player is a corporation. They are all in the same business and are hence mutual competitors. Every shot they play is like a move they make in the market. Most of the time they are moving neck and neck, but every once in awhile someone takes a lead. However, that is not the time to get complacent, because you never know when that lead would be taken away from you. This was demonstrated time and again in the movie. Nothing can be taken for granted and no one considered worthless or unworthy of winning. The golf course is your market. The market is a live, bumbling place but the golf course is alive too. The blades of grass, the sun, the wind, the rotation of the earth are all the variables that keep changing. As Bagger puts it “the blades of grass go one way in the morning and the other in the afternoon”. One has to play the stroke that perfectly matches the variables around us and fits with the overall scheme. There is a scene in the movie where Junuh has to play a shot from the woods. He’s standing there alone in the darkness. He’s reached the limit beyond which he can’t take anymore of his problems. He’s weak and vulnerable and all his sorrows are bearing down on him. He’s almost tempted to bend down and pick up the ball when Bagger interrupts his thoughts. Bagger forces him out of the cage he’s trapped himself in. The cage of helplessness and self pity. He makes him realise that he’s nobody’s prisoner but his own. Nobody in this world has any lighter baggage to carry. It was his choice when to stop carrying that load on his shoulders. If he made the right choice, he could get his life back just the way it used to be. And Junuh chooses. He chooses to let go the sorrows of his past and move forward. It seems that he’s got a new lease of life. He has entered the woods a dejected man and comes out of it with renewed spirit and confidence. He quickly catches up to the other two players. He’s no longer in the shadows, so to speak, but just as great as the other two world leaders. The most crucial lesson that the movie teaches you is to play fair. No matter how big the odds are or how great things are going. There is a scene where Junuh causes the ball to move from its place. What should he do? Should he tell the others? The penalty would cause him to loose a stroke at the fag end of the game. He may well be giving up any chance he has at winning the game. He decides to tell the others about it. But none of the others want him to loose a stroke. They prompt him to say that maybe the light is playing tricks on him or maybe the ball just quivered and fell back in its place. They offered him an exit. He could have taken it and nobody would’ve blamed him for it. But he stood up for what was right, even when there was nobody to lose from it but him. The game eventually ends of course and the movie with it. But it is important to note that the game could very well be carried on, because life carries on. One victory or one outcome doesn’t stop it. There is always another hole to put and another stroke to play. Each triumph is fickle and we must realise that so is each failure. Life of your failure only lasts till you want it to. It may be helpful to remember your losses, to learn from them, but how long you wish to carry their weight is up to you. one movie am defntly gonna c.............atleast aftr readin wateva u reviewed seems like a gud one. as a summary this post is perfect....! as an essay; structured! as an after thought, "well thought"!!! but if this is supposed to be a review then i feel somethings are best watched....!!! that u have so patiently dug into this film and reproduced nearly every high point in ur post is commendable!! this post was an attempt to analyse the movie after having watched it. There are so many times that you come out of the hall after having watched the movie and keep discussing it with your friends all the way home. This is somewhat similar. it is a reflection more than a recomendation. yeah course as a reflection....a grade stuff !!! final placements must be around...best of luck....!! !